Teasel is a biennial plant that is very distinct to identify. The first year plant only produces a rosette of leaves. The second year it can grow to almost 2.5 metres and has a unique flower head. This plant was originally brought to North America from Europe. Interestingly, an average teasel plant produces 3300 seeds that birds enjoy. 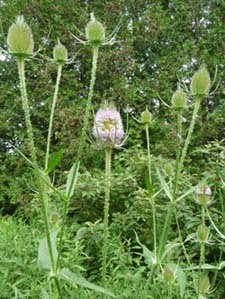 Teasel is self-fertile and it is noted for attracting wildlife. Distinguishing Features: Teasel (in its second year) is unique in the way in which it blooms. Flowers first form in a ring around the middle of the head. The ring of flowers grow in width over a few days, but since the flowers are relatively short lived, the center of the booming section may die off leaving two rings, one growing towards the top and one towards the bottom. Several long, leaf-like bracts branch out from the base of the flower and curve upward around the head. Teasel has a thick taproot and fibrous secondary roots. Flowers: Flowers heads are egg-shaped in outline but cut off squarely at the base. The entire flower head (peduncle) measures anywhere between 50 and 100 centimetres in height and consists of tiny individual flowers that measure 10 to 15 mm long. 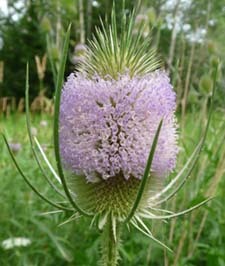 Teasel flowers are lilac and appear between late June and September. Fields of Nutrition has medicinal benefits and vitamin/mineral content of Teasel. 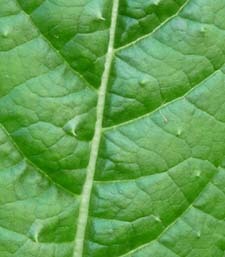 Leaves: The first year of this plant has shiny, green, rosette leaves with scalloped edges, stout hairs on the upper surface of each leaf, and is attached to the stem by way of a petiole (leaf stalk). Second year leaves on the flowering stem are similar to rosette leaves except they are smaller, are opposite with two leaves per node, and have short spines on the underside of the midrib. The leaves are fused around the stem forming a saucer-like shape that holds rainwater. 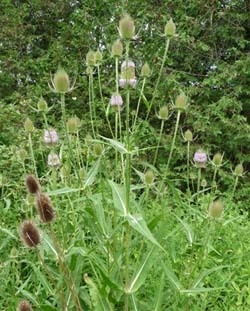 Height: Teasel does not grow in height until the second year. Flowering stems are erect and branching near the upper portion of the plant. Stems are angled and have many small prickles that are turned downward on them. Teasel grows anywhere from 60cm to 2.5 metres tall in its second year. 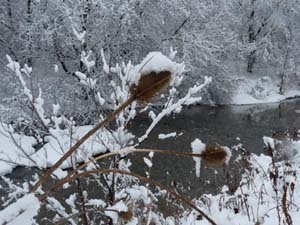 Habitat: Common teasel prefers sunny locations and occurs throughout many parts of the world where it is found in pastures, abandoned fields, roadsides, and waste areas. Teasel prefers damp, coarse and fertile soils. Edible parts: Young leaves are edible although one must take great care to avoid the spiny, stout hairs. 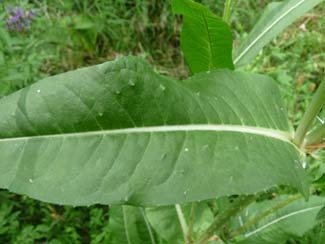 Teasel leaves can be consumed raw, cooked or added to a smoothie. The root can be used in a tea or for making vinegar or tinctures. The root has many health benefits as it contains inulin and a scabiocide.